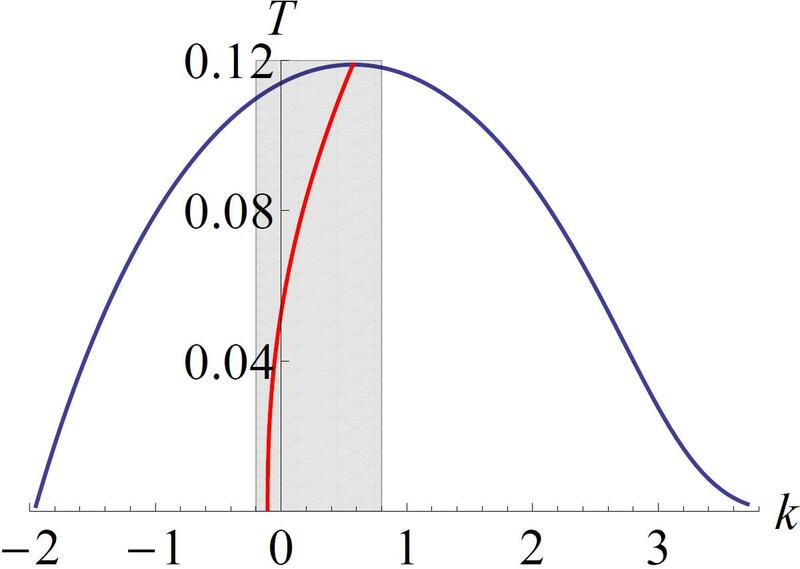 Each point under the blue curve corresponds to a superconducting p-wave black hole with a helical structure at temperature T and with helical pitch 2πk. The red line denotes the thermodynamically preferred black holes which have the smallest free energy at a given temperature. The black holes exhibit a reversal of the direction of the helical pitch at T~ 0.04. The gauge-gravity correspondence provides a fascinating theoretical framework for investigating non-perturbative features of strongly coupled quantum systems using weakly coupled dual gravitational descriptions in one lower space-time dimension. In particular, the thermodynamic phase structure of the quantum system is obtained by finding the black hole solutions with the smallest free energy. Such studies have led to the discovery of fundamentally new classes of black hole solutions and it is hoped that these endeavours will lead to new insights into exotic materials which are observed in nature. Motivated by high temperature superconductors and other exotic materials, there has been a major effort to construct black holes that are dual, via the gauge-gravity correspondence, to exotic superconducting states. Such black holes are electrically charged, asymptote to anti-de Sitter space, typically have planar horizons and have a halo of charged hair. In this paper we numerically construct novel black hole solutions in five space-time dimensions that are dual to p-wave superconductors in four space-time dimensions. In such superconducting phases the order parameter has spin one, in contrast to conventional superconductors where it has spin zero, and this is realised via black holes carrying charged two-form hair. We construct black holes that are dual to two different kinds of p-wave superconductivity and explore the thermodynamic competition between them. Some of the black holes are dual to superconducting phases with a helical Bianchi VII0 symmetry. We show that some of these exhibit the phenomenon of helical pitch inversion as the temperature is lowered, a phenomenon that is observed in liquid crystals. We also study the behaviour of the black hole solutions in the zero temperature and near horizon limit, finding new zero entropy configurations. In some cases they approach solutions which are dual to helical ground states while in others they approach anti-de Sitter space which is associated with a novel emergent conformal symmetry in the dual theory. Aristomenis Donos is a postdoctoral researcher at the Department of Applied Mathematics and Theoretical Physics, University of Cambridge. Jerome Gauntlett is a Professor of Theoretical Physics and Head of the Theoretical Physics Group at Imperial College, London. Christiana Pantelidou is a PhD student in the Theoretical Physics Group at Imperial College, London. This entry was posted in Author Insights, IOPselect and tagged black holes, superconductors by Adam Day. Bookmark the permalink.